Pittsburgh is a very large city, and so contains a particularly big selection of shopping districts to meet to needs of local communities and visitors. Downtown is where you will find the best selection of shops in Pittsburgh, with many traditional department stores on offer here. The best shopping in downtown Pittsburgh lies around the Market Place, along with 5th Avenue and its intersecting Smithfield Street, where the biggest stores include Kaufmanns and Saks. Also in the downtown district is the One Oxford Center Atrium, on the corner of 4th Avenue and Grant Street, which is part of a towering skyscraper complex and is much more than just a shopping center, being home to a number of eateries and nightclubs as well. Not all shops are open seven days a week, with the smallest choose to close on Sunday. However, the big name stores and largest shopping centers in Pittsburgh do feature long hours, opening anywhere between 09:00 and 22:00 Monday through Friday, and again on Sunday, often from 12:00 until 17:00, or thereabouts. 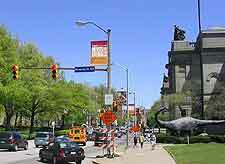 Other very noteworthy shopping districts in Pittsburgh include the enormous riverfront Station Square on Smithfield Street, and also the South Side Works complex next to 28th Street, both of which lies within the South Side and close to the Monongahela River and university. 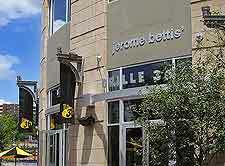 Further shops are to be found along the Strip, and other roads such at Bellefonte Street and Walnut Street. The easterly suburbs of Monroeville is just a relatively short distance from the central business district and is where you will discover the acclaimed Miracle Mile Shopping Center, which dominates much of the Monroeville Boulevard and is brimming with different stores, of all sizes.